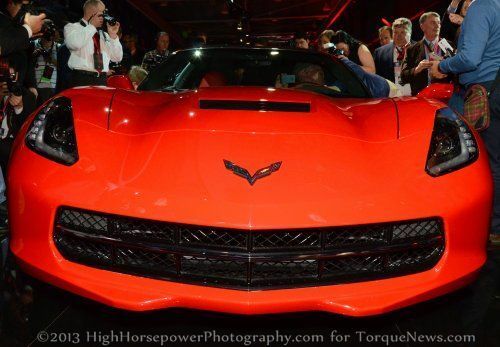 The 2014 Chevrolet Corvette Stingray has taken the world by storm since being introduced at the 2013 Detroit Auto Show and prospective C7 buyers are chomping at the bit to put the new GM sports car in their garage. In fact, General Motors believes that the early rush for the new Stingray is going to be so high that the demand will comfortably exceed the production capabilities. In order to make sure that the early examples of the 2014 Corvette are not left sitting, unsold on the showroom floor, GM has placed some fairly simple yet surprisingly exclusive requirements on those dealerships who want to get their hands on the new Vette right away while the rest of the Chevy dealerships could be waiting almost a year before they are able to sell the gorgeous new Corvette. General Motors wanted to first make sure that their highest volume Corvette-selling dealerships had early access to the 2014 Chevrolet Corvette Stingray so the company has filtered out all of the dealerships that sold at least 4 Corvettes in the 2012 calendar year. Out of the (roughly) 3,000 Chevrolet dealerships in the United States, about 900 of them sold at least 4 Corvettes last year and last week, GM notified that group of businesses that they will be among the first to sell the 2014 Chevrolet Corvette Stingray. This means that only about 30% of Chevrolet dealerships in the country will be able to sell the C7 Corvette during the first 6 to 9 months after the launch. While some Chevrolet dealerships are bummed that they could be waiting almost a year before getting a 2014 Chevrolet Corvette Stingray, the Corvette is a low volume production car and the early demand will almost certainly vastly outweigh the production rate. The last thing that GM needs is a new Corvette serving as showroom décor for a dealership that won’t be able to sell it while other dealerships are sitting on orders that cannot be filled due to production constraints. General Motors sold 14,132 Corvettes last year across their network of over 3,000 dealerships which accounts for an average of around 4 Corvettes sold per dealership so the company has essentially allocated the first 6 to 9 months of 2014 Corvettes to those who are above the average. In addition to meeting the 2012 sales requirement, dealerships who want to be included in the sales launch of the 2014 Chevrolet Corvette Stingray will also have to follow some other guidelines receive early allocation. First, the dealership must have a mechanic in their service department who has been trained to work specifically on the new Corvette. Next, the dealership has to have a Corvette sales expert and receiving that certification requires the salesperson to attend the 2014 Corvette Stingray Dealer Sales Academy at Sprint Mountain Motorsports Ranch in Pahrump Nevada. This training session runs over the course of two days and costs $2,000 per attendee – not including travel expenses. There will be further requirements placed on the dealerships once we get closer to the launch late this summer that I would guess relate to showroom display items. These types of allocation requirements are fairly common, especially for low volume vehicles like the 2014 Chevrolet Corvette Stingray. The Chrysler Group had to come up with a similar allocation process that included special sales and service training along with some pricey tools and showroom display items. Even though many of the dealerships who will not be included in the early allocation of the new C7 Stingray don’t sell many Corvettes, having one on the showroom floor helps to draw traffic to the dealership. Many of those tire kickers who arent in any position to buy the new Corvette will drive out in the same car that they drove in but having more people come into the dealership where an annoying salesperson can work on them helps to build a relationship with the customers that could result in future sales – be it a Corvette or something else. For instance, the Chevy Camaro starts at roughly half the price of the Corvette so some Stingray dreamers who come to the realization that they cannot afford the C7 may opt for the more budget friendly Camaro. This all makes good sense for the dealership but it doesn’t make any sense for GM to send showroom eye candy to dealership who can’t move units while others have customers with cash in hand, eagerly waiting for their local Chevy dealer to get their new Corvette. The good news for those 2,100 or so Chevrolet dealerships who are excluded from the early allocation process is that after the 6 to 9 month period after this summer’s launch of the 2014 Corvette Stingray, the new Corvette will become available to more dealers around the country. However, the promise of having one in the summer of 2014 may have a great many dealerships wishing that they had sold just a few more Corvettes in 2012.